The Fourth Symphony is played here, as usual, in its revised version, though in the last twenty-five years a few recordings of the original version (in many ways preferable) have appeared. Bosch gives a performance rather lacking in weight/gravitas. Of course, the leaner modern way is refreshing, when compared with the suet pudding approach to Germanic repertoire, which used to be the norm fifty years ago, but one has to be careful to avoid going too far in the other direction. In the introduction I feel that the darker hues and essential seriousness are underplayed, the result bordering on the perfunctory. The main Lebhaft section is taken at a steady tempo, but here I feel a lack of urgency and of total engagement. Sadly an impression of routine is unavoidable. In his excellent BBC Guide to Schumann's Orchestral Music, Hans Gál puts his finger on some crucial aspects of the composer's style, such as exuberance. To quote extracts - “His soul is in every expressive phrase he shapes, and the instrument has to sing in order to do it justice” ... “expressive intensity” ... “rapturous fervour” … A frequent expression mark to be found in his music is “innig” - “with intimate feeling”. I'm afraid that I quote these wise words for a negative reason. One cannot honestly say that Bosch “connects” with Schumann's music. The qualities mentioned by Gál are not desirable extras – they are the life-blood of Schumann. For instance, the all-important expressive intensity is absent. 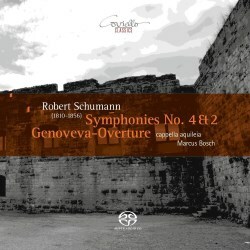 In the first three movements of this symphony Bosch is efficient, but emotionally lightweight. The finale certainly has energy, but crispness and clarity are achieved at the expense of expressive ardour. In short, Schumann without this emotional current is an under-nourished Schumann. Equally, the tendency to literalness and plainness makes one crave that rarer quality of imagination. The Second Symphony introduction lacks expressive warmth, while the tempo increases are not organic. Surely they are intended to be. In the Allegro the dotted rhythms are not tight enough to convey the required nervous intensity and the character is worryingly passionless. The scherzo has a nice energy, but this is quite unrelieved - again rather literal, where more nuance, subtlety and flexibility would be desirable. Dynamics also are a little too generalised, with an absence of contrasting piano passages. In the slow movement I have rarely heard such a cool approach. I wish I could say that there are benefits, as there might well be in other repertoire, but unfortunately this manner throws no light on Schumann's music. In one of his earlier recordings Bernstein, in wringing out every drop of emotion, makes this profound movement sound unhealthily close to Mahler, but at least his approach is based on a deep love of the music. Here we are heading in the opposite direction. Hairpins are accurately observed and the long chains of trills do crescendo to a climax each time, but one cannot escape a feeling of emotional detachment. The little fugal episode is neat and precise, but short on mystery. I imagine Bosch's forte might well be contemporary music, so I shall look out for his CDs in such repertoire. The finale of the Second Symphony evokes that same description I used earlier – perfunctory. The performance of Genoveva Overture is much the same. In the booklet it is timed at 33.24! Cappella Aquileia – also known as Württembergische Kammerphilharmonie Heidenheim – plays well enough, though the timpanist's occasional over-enthusiasm should have been tempered. According to the booklet notes, the 55-strong ensemble “is oriented in its musical parameters such as sound, articulation, phrasing, vibrato … to the performance practice of Schumann's time”. Sadly my main impression is that Schumann and Bosch are rather a mismatch.